As a toddler my Mom read ‘The Very Hungry Caterpillar‘ to me, and I noticed that the book is still around today. 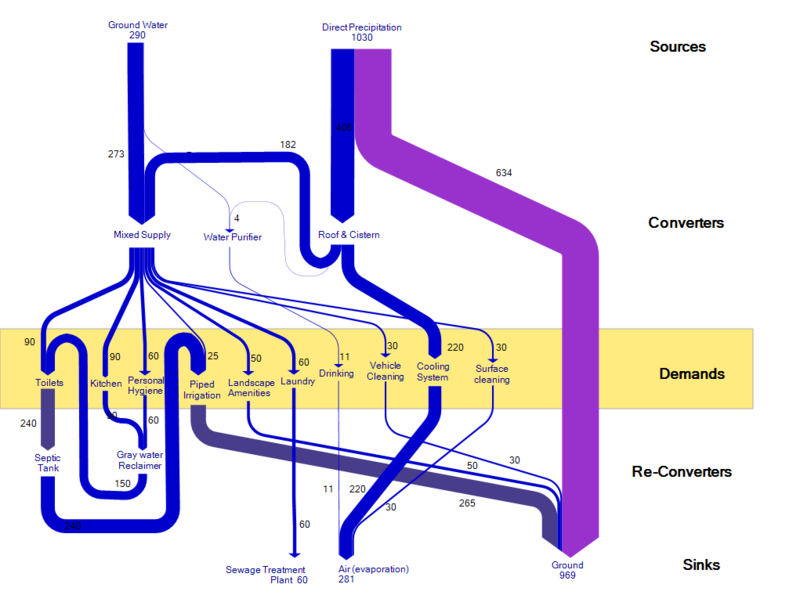 So I thought you might like the following mini-Sankey diagram I found on an educational website. Interesting project described in the blog article ‘Understanding your city by understanding its flow: towards Participatory Urban Metabolism Information Systems’ by Sven Eberlein of the Ecocitizen Worldmap Project. This is a participatory approach where young citizens track the water flows in their city in a crowd-mapping approach. The data is visualized as Sankey diagram (here called MetaFlow diagram). Pilots were carried out in Casablanca and Cairo. This project is somehow linked to Sebastian Moffat’s activities I have featured in a blog post back in 2008. This seems to be the result from either the Casablanca or the Cairo field work. 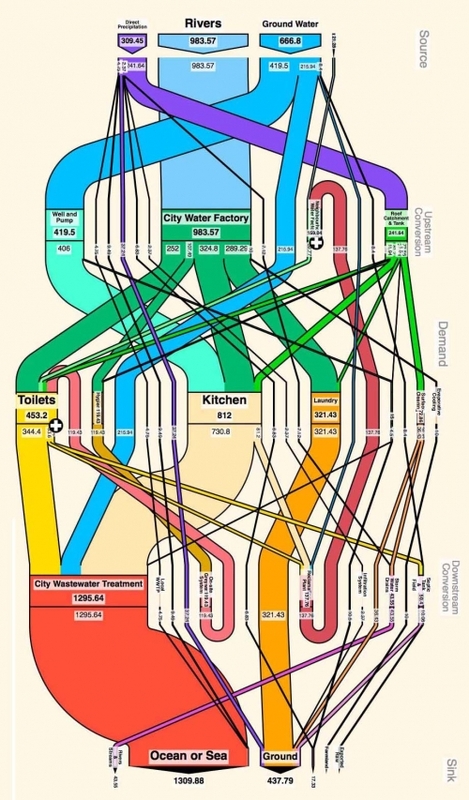 Great colorful Sankey flow diagrams. Judging from the photos in the blog post, working with the local community seems to have been fun. The participatory approach is emphasized (Sven calls this a ‘Participatory Urban Metabolism Information System (PUMIS)’). More Sankey diagrams can be seen in the original blog post. After my last post on the Paris Urban Metabolism I continued to research that topic a little more. I came across another example from France. 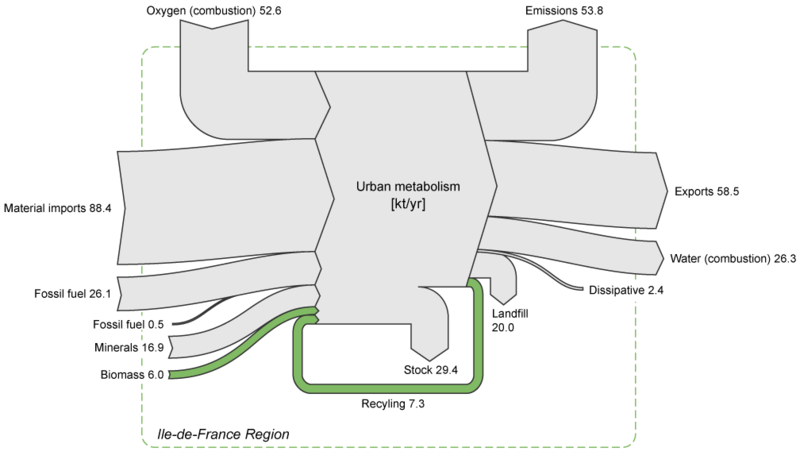 The below Sankey diagram is from an article on territorial metabolism in the rural village of Contres in France. (“H4 développe une démarche de métabolisme territorial à Contres”). In this study, the consultant company H4 Valorisation analysed the material and energy flows liked to the villages economic and agricultural activities. Different scenarios were evaluated, focusing primarily on (1) reducing imports and rejects (waste and pollutants), (2) increasing usage of local resources, and (3) looking at reuse of material internally (les rebouclages internes). The Sankey diagram shows both mass and energy in one diagram, so the inputs and outputs of the central node (representing the village of Contres) are not balanced when summed up. Mass flows are in tons (per year?) in blue and red colors. Energy is in Mwh per year and shown in orange color. Greenhouse gas emissions from energy used is also represented in pale yellow expressed in tonnes of CO2-equivalents. Haven’t seen many Sankey diagrams dealing with urban metabolisms. So I was happy to stumble across this one for Paris, France on Nels’ blog. 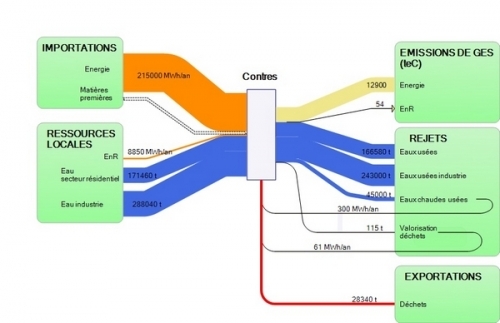 I have posted several Sankey diagrams depicting the energy flows of countries. At least California and West Virginia have published state energy flow Sankey diagrams. I was quite excited to discover the two metropolitan energy flow Sankey diagrams shown below in this publication. They are for Toronto and Helsinki and show energy flows in 1988 in these communities. The two diagrams show energy consumption and use in Toronto (above) and Helsinki (below). Even though the absolute figures in GWh are given, one shouldn’t directly compare them. A per capita basis would be fairer (Toronto had a population of 2.5 mio in 2006, more than 5 mio. in the metro area, while Helsinki had 580.000 inhabitants in 2008 in the city, 1.3 mio in the greater Helsinki area — Toronto is today 4.5 times larger than Helsinki). Both are “cold-climate municipalities”. Does anybody know other metropolitan energy flow studies? I am aware of research activities in the field of urban material flow accounts or urban metabolism (e.g. Lisbon) but have to check whether they show Sankey diagrams in their publications.